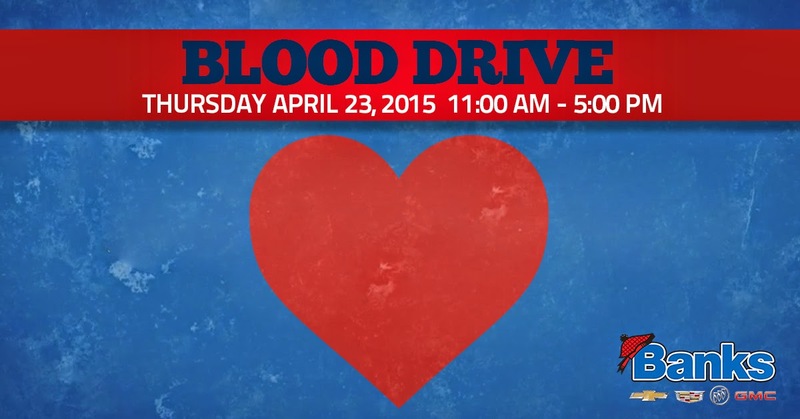 Banks Chevrolet will be hosting an American Red Cross Blood Drive on April 23rd, 2015 from 11:00 AM to 5:00 PM. Donations make it possible for the Red Cross to provide blood for patients in nearly 3,000 hospitals across the United States. Help save lives by donating your blood to the American Red Cross at the dealership, located at 137 Manchester St., Concord, NH 03301. 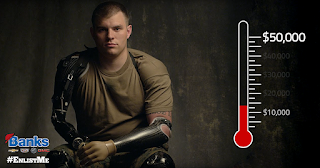 After two successful blood drives in 2014, Banks Chevrolet is hoping to set the bar even higher this time around. They are expecting an even greater turnout from the community at their third blood drive and will be offering a free "wash and vacuum " service to anyone who donates blood on that day, as well as a $10 service coupon. Furthermore, Subway will be offering a free 6" sub to anyone who donates blood on that day. "We hope for, and are preparing for an even larger crowd than last year," said Brad Solomon, Customer Care Manager at Banks. "We encourage those who live in Concord and surrounding areas to come participate in this worthy cause." To schedule your appointment to donate blood at this event, visit www.redcrossblood.org. 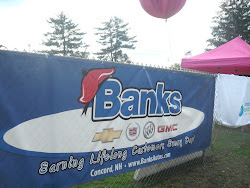 Call at 603-229-4176 or visit www.bankautos.com to learn more about how you can help. We will be open Sunday from 10am-4pm with FREE food and great prizes! Chevrolet’s corporate analysts sought out Tim Sattler, Inventory Ordering Manager at Banks Chevrolet in Concord, NH, for advice on improving ordering operations. He was one of a select few across the country that were asked to assist in this Chevrolet management project. During an in-depth series of interviews, Sattler discussed the successful operations and customer satisfaction strategies used at Banks. Sattler provided insight into ordering and how different configurations and options resonate with customers online and in the showroom. Chevrolet’s objective was to understand what factors drive decision making for vehicle ordering. This includes coming to the right mix of models and trim levels, how each one is specifically equipped, and what options and colors make the most sense. Sattler explained the effects of having too many or too few buyer options and how that can impact sales. A few key factors have led to the success in ordering and stocking at Banks. First, Tracy Banks, owner of Banks Chevrolet, has always understood the concept that a dealer cannot sell from an empty shelf, so she makes enough financial resources available so that Banks can stock a large inventory of vehicles. Secondly, the management team has years of experience and while it’s sometimes a moving target in a volatile marketplace, they have a good understanding of what's going on in the market, what the competition is doing, and what trends will be important to customers. Additionally, Banks has dedicated a single person with the primary role of ordering all inventories, which allows focus and eliminates distractions. Most importantly, Banks listens to what their customers are looking for, and will make the appropriate adjustments to better meet customer expectations. Chevrolet will put this information to use as they continue to work to improve vehicle configurations to best meet the wants and needs of the customer without offering too many choices. GM and Chevrolet are sincerely focused on constantly improving their operations by minimizing customer confusion when selecting a vehicle, increasing satisfaction with the purchasing process, and thus increasing sales. Thank You to All of the Blood Drive Participants! 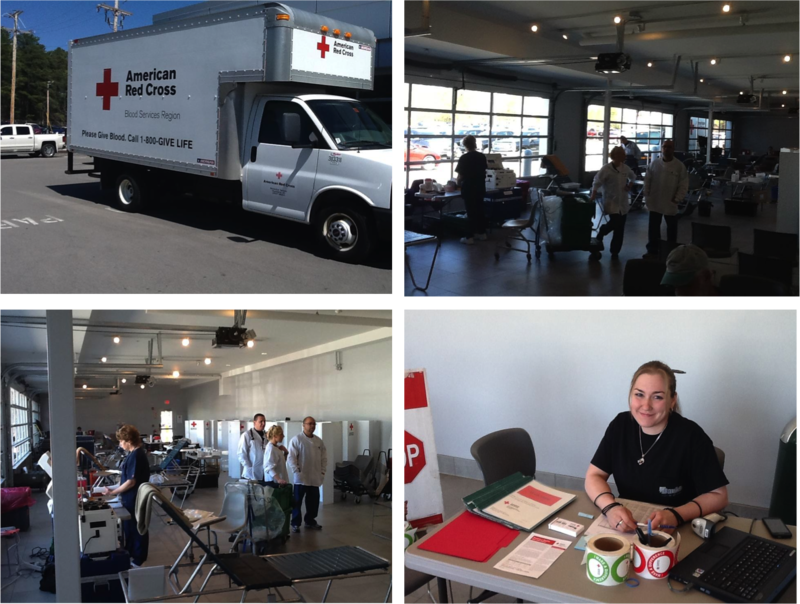 Thank you to everyone who came out to our first blood drive for theAmerican Red Cross! We were amazed by the overwhelming amount of support from our employees, customers, and friends in the Concord community. The event was a great success with over 60 participants who donated their blood to help save lives. 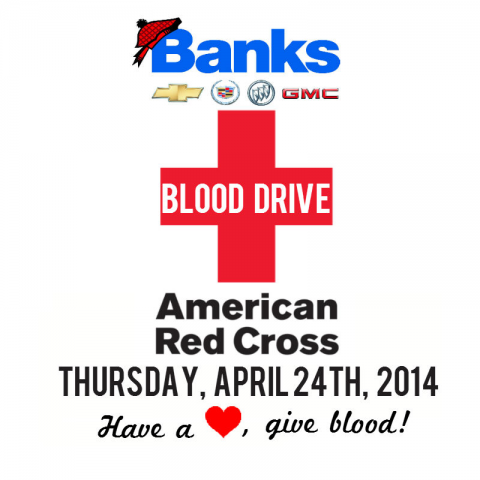 Banks Chevrolet will be hosting an American Red Cross Blood Drive on April 24, 2014 from 11:00 AM to 5:00 PM. Donations make it possible for the Red Cross to provide blood for patients in nearly 3,000 hospitals across the United States. Help save lives by donating your blood to the American Red Cross at the dealership, located at 137 Manchester St., Concord, NH 03301. This is the first time Banks Chevrolet has ever hosted a Blood Drive but they are expecting a great turnout from the community. Banks Chevrolet will be offering a free "wash and vacuum " service to anyone who donates blood on that day, as well as a $10 service coupon. Furthermore, Subway will be offering a free 6" sub to anyone who donates blood on that day. 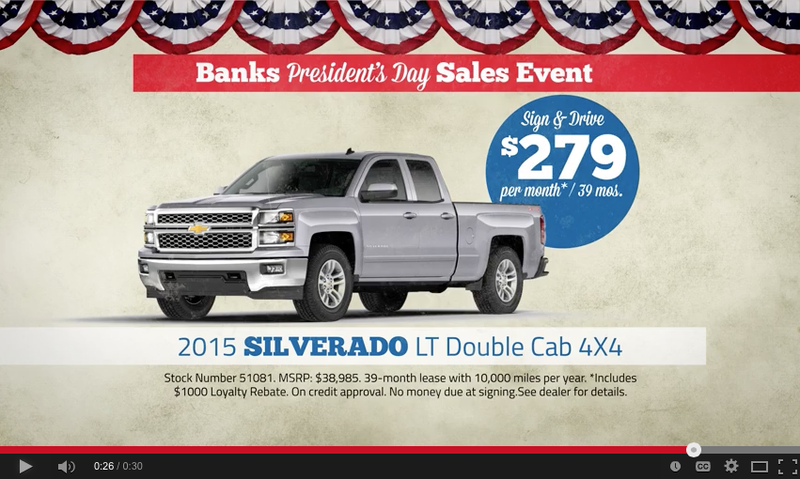 Banks Chevrolet service manager Rick Gauthier has been spearheading the event planning. Always charitable and active in his community, Gauthier became inspired when he heard the story of Jacqueline Rogers back in January. "I was watching the news one morning and I saw a story about an 8 year old girl from Boston," says Gauthier. "She was scheduled to go in for life saving heart surgery, and the parents got a phone call on the way to the surgery and were turned around because the hospital was low on blood. 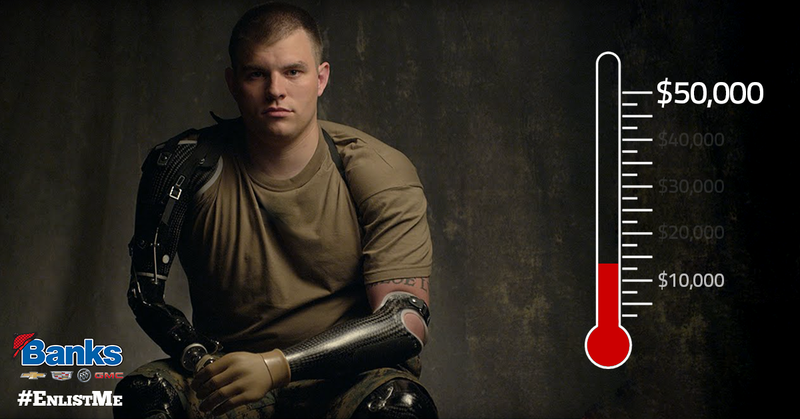 That made me want to go donate some blood." Gauthier continues, "At that point I figure we have over a hundred employees and thousands of great customers, so we could make a big impact." More information about Jacqueline Rogers is available at this link. "We hope for, and are preparing for a large crowd at this event," said Brad Solomon, Customer Care Manager at Banks. "We encourage those who live in Concord and surrounding areas to come participate in this worthy cause." To schedule your appointment to donate blood at this event, visit www.redcrossblood.org. Call at 603-229-4176 or visit www.banksautos.com to learn more about how you can help.